ASUS Eee Pad tablet computers - out early 2011? ASUS Eee Pad tablet computers – early 2011 release date? ASUS are another company getting into the tablet computer space, with its Eee Pad – which will be available in 10 inch and 12 inch versions. Prototypes of the Eee Pad were shown off at the Computex show, back in May. The 10 inch model will have the model number Eee Pad 101, the 12 inch Eee Pad 121. ASUS are currently testing the machine with the Froyo version of Android, but for the January release it could very well be the next version onboard, Gingerbread (aka Android 3.0. Windows Embedded Compact 7 was originally slated for the Eee Pad 101. In addition to the two sizes of Eee Pads, ASUS are also preparing a keyboard accessory dock into the Eee Pads. As you’ll see in the video below, it turns the tablet computer into a notebook computer, very much as we saw in the now aborted Lenovo IdeaPad U1. The educated guess is that the Eee Pad will be shown in more details in January 2011, at the Consumer Electronics Show in Las Vegas, with the product release very shortly after the show. The price? No details at all on that as yet. 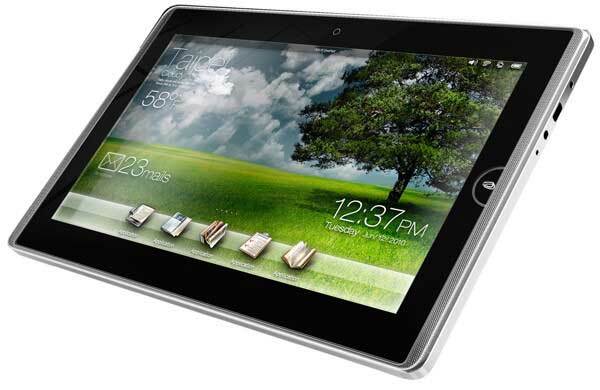 UPDATE MAY 24, 2011: The Asus Eee Pad Transformer TF101 goes on sale in Australia on May 25, 2011. For full details read Asus Eee Pad Transformer tablet computer on sale tomorrow. Next ArticleNokia’s E7 – its next flagship smartphone? And so it begins, I have every belief that within a few short years the laptop will go the way of Beta, the cassette tape and so on. Welcome to the evolution!